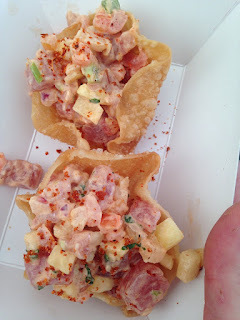 I finally started my return to food festivals this year! Rather than being a presenter, I was actually part of the massive “foodie” crowds in pretending I “knew” what I was talking about to restaurant owners and purveyors. It felt odd since I am used to bein on the other side, but it was wonderful to just relax and enjoy the food, wine and the weather. My first was the Baltimore Seafood Festival and it was hot. Unfortunately since I have been so late on sharing articles in recent months, I unfortunately do not remember specific details which include where I tried certain items. However, since it was a “seafood festival” most of the items I sampled are not hard to decipher. Location: Was great to be naturally in the weather in a great area of Baltimore. Oysters: They were not too bad. Even though I do not remember exactly which purveyor I tried the oysters, they were very good. 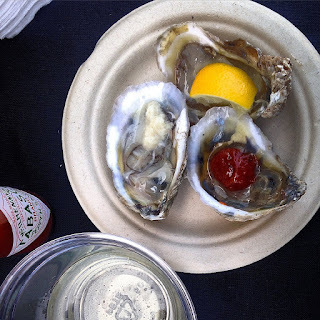 I am a pacific oyster lover and despite these being East Coast oysters, I really enjoyed them. Refreshing and I think the additional toppings helped. Cost: I was not impressed by the cost. Though you paid a reasonable $38 in advance, you only received 10 tickets and those 10 tickets did not translate well with the vendors and their portions of food. I understand oysters can be expensive but if they are local there should not be much competition with the cost. I had to purchase more tickets in order to feel like I got my “experience worth” of food. Maybe I am just used to the festivals in the South stuffing you with food to the point of no return. 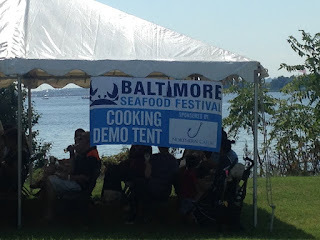 Overall: Though this is their 2nd attempt at this type of festival, I praise it especially for having something like this during the warmer months of the year and to attract more visitors to Baltimore, a challenge I know faces regularly. Looking forward to the next one!